Our landlord came home today with a big pump, which I thought was for his motorbike tyres. I couldn’t have been more wrong. Within a few minutes he was pumping a foul smelling liquid down the latrine. 20 seconds later the penny dropped. Thousands of huge dead-man-walking roaches swarmed out of the latrine pit, in a futile bid for safety. Without too much exaggeration, if you had been sitting on said latrine at the time, it would have made the cut for a B grade horror movie. Four children, myself and two chickens were waiting to prevent the roaches encroaching (apologies) on our house, armed only with sticks and beaks respectively. It was amazing that the chickens even survived after eating hundreds of insecticided bugs. Again to avoid flashing the camera around, I didn’t get a photo or video of the invasion itself, but here’s a rogue roach that managed to traverse the gauntlet of people + chickens into our bedroom. We should celebrate though, the latrine is now roach-free after being flushed out (apologies again) by the lethal local lotion. This entry was posted in Frivolity, Lifestyle, Nature. Bookmark the permalink. 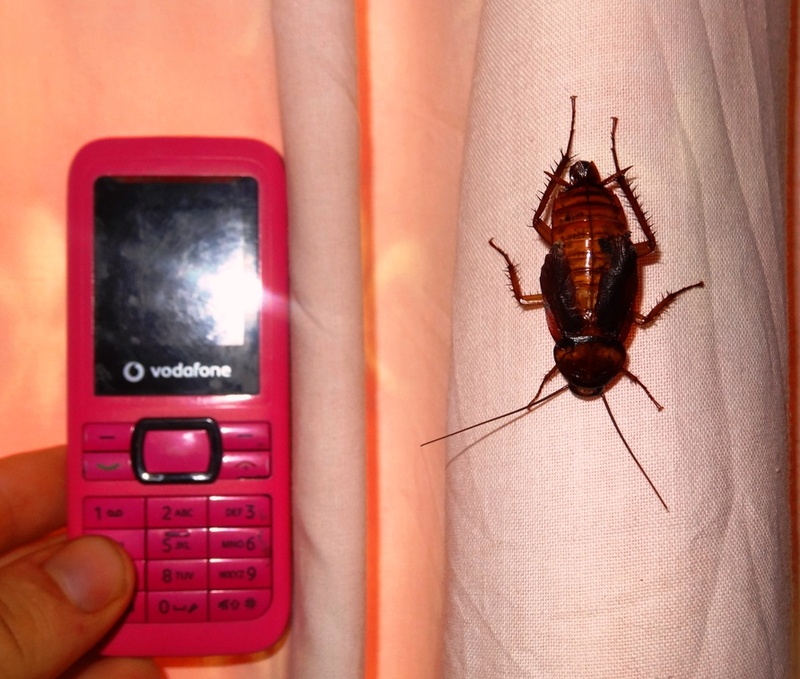 Hi you ‘Ugandapandas’, welcome to Uganda!The cockroaches will be you hidden (or not so hidden) friends all the time you are in Africa. They are a pretty hardy species and take a bit to knock over so the potion you land lord used must be pretty good! On Friday the 2nd August I am speaking on your behalf at the CMS Support Group mtg. So if there is anything you would particularly like me to mention about your current needs please send an e-mail with your requests. I am going to use some of the stuff I copied from your flash drive. Your house sounds to be in an ideal location for language learning. The potion was pretty brutal. It smelt so bad I certainly didn’t want to put my hands in it like the locals were. The government (probably with aid money) provides it for free for mosquitos and cockroaches. Thanks for speaking on our behalf Ross I’ll send you an e-mail :). Yes there are termites around, which is why many people avoid constructing buildings with a wooden frame. Apparently as long as you keep away from them though they aren’t a big problem! Am going to put up a post soon about the white ants which are a delicacy here! That is one big nightmare inducing bug! Ha indeed Rosalie. Luckily it seems they have not bred in our wee flat. We found two that survived the loo-bombing but they must have either been the same gender or not had the opportunity to ‘meet’ each other in a timely manner ;).